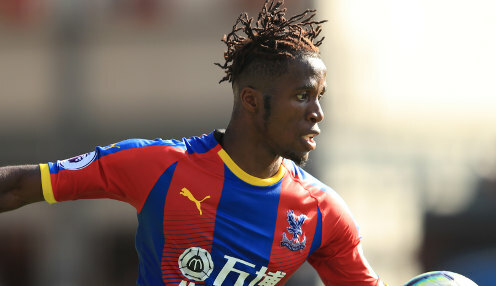 Roy Hodgson remains hopeful that Wilfried Zaha will be able to play for Crystal Palace in Sunday's Premier League clash at Everton. The former Manchester United winger sustained a muscle strain last week during Ivory Coast's 4-0 win against Central African Republic. Zaha has not been able to take part in full training but Hodgson has played down fears suggesting his star player will be out of action for two months. "It's good news that he's close enough to be assessed, to see if he is fit enough to play," said the former England, Liverpool and Fulham boss. "If he is able to train on Saturday I guess he could be available to play. "I don't know where the information that this is a two-month injury came from, but we've never been mindful that it would take such a long time. "It's a strain which players get on a fairly regular basis and some recover quicker than others. Wilf is a quicker than normal recoverer but it will depend on the extent of the injury whether he is a possibility to recover or not." The Eagles can be backed at 5.25 to win at Everton on Sunday while they are available at 5.00 to keep a clean sheet in the Goodison Park encounter.